A famous superhero movie once carried a dialogue, 'with great power comes great responsibility'. What it failed to add is that with great power, comes good publicity and therefore a lot of half knowledge. Needless to say, that has been the case with solar with plenty of opinions shared, some true and some not so. It is interesting to note that several high profile people have voiced their opinion on how solar still does not look to be a viable option and that fossil fuel is still the more practical solution. Sure to say that these people are well aware of the impact that fossil fuel has on the environment. So, before you are swayed here is a comparison on why solar indeed is a superhero that the world today deserves, and wants. And just like some of the real life super heroes, it indeed does not wear a cape. Here are ground realities and an apple to apple comparison. Among the top 10 module suppliers, 9 are Chinese. Each of these top five module suppliers has a capacity in excess of 3500 MWp. Total installed capacity of Tier 1 module suppliers in the world is 45435 MWp out of which Chinese Tier 1 module capacity is 37150 MWp. This constitutes more than 80% of the Tier 1 Module capacity globally. We too have used Tier 1 Chinese modules and they have been in the field for more than 5 years and we have not experienced any issues. Module suppliers specify the power degradation of modules over 25 years and they offer a power warranty as well. The most common rate of degradation specified by the modules suppliers is 2.5% in the first year and 0.7% linear YOY. We have not seen more than 0.5% degradation YOY in our plants so far. Wherever possible, we have taken the warranty from the parent company and also third part insurance from companies like Re-Munich or Powerguard just in case the manufacturer is unable to serve the warranty. 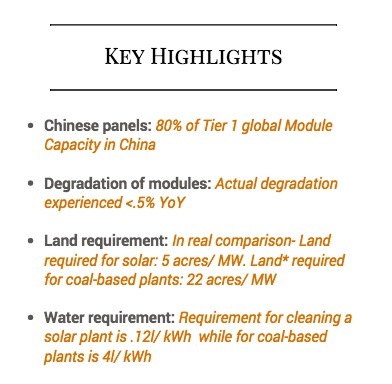 There is a detailed report by a US acclaimed lab, NREL, on the degradation of modules where they have studied a large number of modules across the world and confirmed the mean degradation rate at 0.5% YOY for crystalline silicon module technology. The area required for the 60 GW of ground mounted solar capacity is 3,00,000 acres or 1214 sq.km. It is only 0.5% of the total wasteland area of the above states. In fact, wasteland area of Rajasthan alone is sufficient to meet India's solar capacity target. Thermal power plants require on an average 1.8 acres/MW as per Centre for Science and Environment (CSE). Over 40% of this area is used for disposing of ash. As per a publication by Down to Earth dated February 28, 2015, if we add the land used for coal mining, water reservoir and ash pond to this, then a 1000 MW plant requires 21745.27 acres over its lifetime. Converted to per MW requirement it works out to be 22 acres* per MW in the lifetime of a coal plant. In comparison, Land requirement of 5 acres per MW by solar is just a fraction of this need. Moreover, the land used for solar can be easily put to the other use after the life of the plant is over. Cooling towers require water and much of it is lost due to evaporation. The average water requirement for Indian coal based thermal plants is 4 liters/kWh. Some old plants require as much as 9 liters/kWh. Many thermal plants in India have to be shut down in summer for want of water. Water shortage has resulted in coal plant shutdown in West Bengal, Karnataka and Maharashtra. NTPC, Adani, Mahagenco, GMR, KPCL were the affected companies. Total revenue loss due to a shortage of cooling water in 2016 alone was Rs. 2400 Crore. This situation is likely to be accentuated further as more thermal capacity is added. In a country where water for domestic consumption is not available, the public reaction is expected to be exasperated and unknown. In contrast, Solar requires water only for cleaning of panels and that too most plants need only 18-24 cleanings in a year. In monsoons, the panels are automatically cleaned by rain water. There is no evaporation loss and water used for cleaning is absorbed by the ground. The water consumption for cleaning is minuscule at 0.12 liter/kWh. Looking at the data, the externalities of a solar plant is much less compared to coal based thermal power plants. In short, going solar looks to be a genuinely viable option. For once, the hype and interest that you see around you is the real deal. It is time to move on from the sources of energy that we have historically relied upon cause something truly magical is indeed here. Disclaimer: The figures and information written in the article are from the perspective and experience of the author whose biography follows the article or referenced from published articles or reports which have been duly credited with a corresponding link in the article content. MYSUN does not claim ownership of the same. About the author: This article has been contributed by Dr Amitabh Verma, CTO at Solar Power Aditya Birla. He has lead projects in Gujarat, Rajasthan, Telangana etc adding up to a capacity of 80 MW in total. He is a dear contributor at MYSUN as a guest author. If the Lifetime of Solar Panel have exceeded, how do we able to destroy the Panel.. Note: They wont degrade even when kept under the soil i.e Affects the Soil fertility..i have a major doubt on destructing the panel after its extension of lifetime, also searched in many websites for the Answer,. please kindly reply !! i cant able to start my work without knowing the answer for this question. 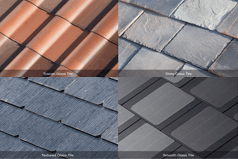 The most effective way to dispose the PV panels at the end of its lifetime is by recycling it. One such method is developed by PV CYCLE. We researched and dug out the following information from http://www.pvcycle.org/press/breakthrough-in-pv-module-recycling/. “PV CYCLE is a collective compliance and waste management scheme for WEEE (Waste Electrical & Electronic Equipment) and Battery products, with a special focus on solar energy system equipment. PV CYCLE has developed a process which allows the recycling of silicon flakes, a combination of EVA laminate, silicon-based semiconductors and metals, in an economic and environmentally sound manner. The advanced process is currently being applied at one of PV CYCLE’s Europe-based recycling partners for silicon-PV modules.